Modern Forestry — Ginger writes. Today I needed two birthday gifts, a new neighbor gift, and blog post material. Actually I have been planning since Christmas to write about this topic on the blog, and the day has finally arrived. Prior to Christmas, my best guess is that I had not owned a candle in at least ten years. I'm not counting Advent candles or loss-of-electricity candles in this figure. I mean the kind of candles you buy for their smell and decorative appeal in the home. 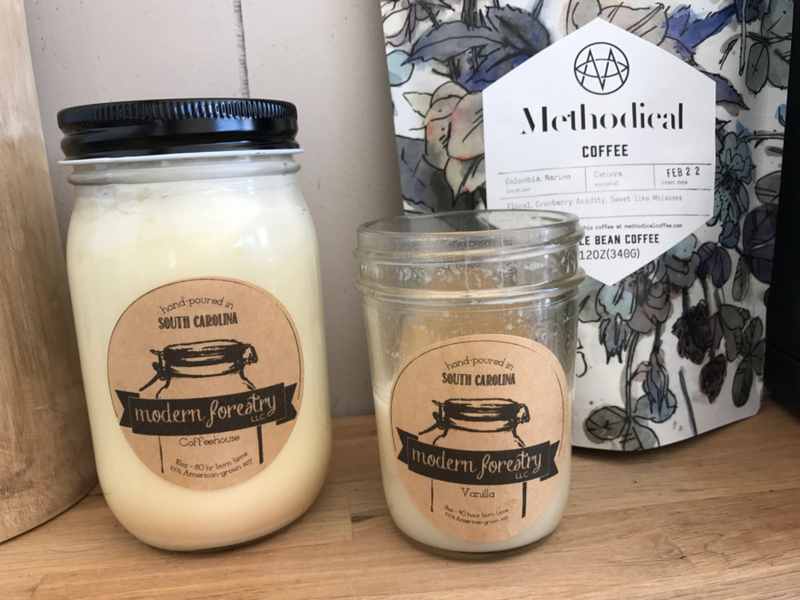 Out of nowhere, TJ gave me two candles for Christmas and I fell in love with Modern Forestry, a local company owned by a husband and wife team who make hand-poured soy candles. Although there's a Modern Forestry Etsy shop, TJ went double-local, by going to Swamp Rabbit Cafe & Grocery and choosing the big Coffeehouse and the small Vanilla for me. Had he known which I'd end up liking more, he would have switched the sizes on the scents. The Vanilla is what I like to burn when I sit at my writing table and the Coffeehouse is what we burn for Story Circle. Can you tell I do a lot more writing than story circling? The candles are so deliciously strong and perfect that if you're in close enough proximity (such as at a writing table in a bedroom), you don't even always have to light the thing to experience the peace and calming of the scent. I just sit sometimes, with the jar of the unlit candle held to my nose and delight in the fragrance. This is coming from a non-fragrance person. I don't seek out smells for my home or my body, which is why I've had trouble fully embracing the essential oils movement. I like to walk into my places and smell nothing, which is to say I like to not even notice that I'm smelling nothing. But when I write and read and pray alone in my room, I like to smell my Vanilla candle. And because I like to share my likes, I went to the Swamp Rabbit Cafe this morning with the full intention of buying three more Vanilla candles today, two for the birthday people and one for the new neighbor. How, though, could I resist "Birthday Cake" and "Lake House," or letting the cashier put the candles in these cute little Swamp Cafe baggies? I love Modern Forestry even more for having a candle called Lake House. Our new neighbors, who were actually old acquaintances, are now becoming friends. They are renting the house across the street from us for the next year, which means they are also on the lake but with a different view. Who knew? Out of nowhere came not only my two candles for Christmas, which I now love, but also these new friends with their four kids and homeschool bent and chicken coop. I do wonder how long God had this great surprise up his sleeve. Again and again, things happen that remind me that God can do anything. He can make something out of nothing, can bring people into your life that you never knew you needed, can make Lake House appear on a candle when you would least expect it. You can live on a street of older people with no kids in sight, and you can want to know about raising chickens, and you can second-guess your school decisions, and you can feel your friend quota is generally adequate. Then God says, Nope, here's a new friend for you. Here's some kids for your kids to be buddies with. Here's some chickens to learn about, and some eggs to eat. Here's homeschool encouragement, lakeside chats, a neighbor who loves figs and writing letters and Christian community just like you do, Ginger. My response is thanks and more thanks. Thank You, God, for knowing me and thank you, God, for blessing me. And now let me be a blessing in return. I'll walk across the street later this afternoon, as the moving trucks unload our neighbors' stuff, and I'll give my new friend a candle called Lake House. I'll give her a loaf of fancy bread and some daisies in a vase, not to say I'm so kind, but to say Isn't God kind? And if you don't believe me, just buy yourself a Modern Forestry Vanilla candle and smell it any time you forget God's kindness. That is Jesus in a jar, if you ask me.